You may think that visually sensing colors is a complicated operation, requiring a camera or other advanced sensors. 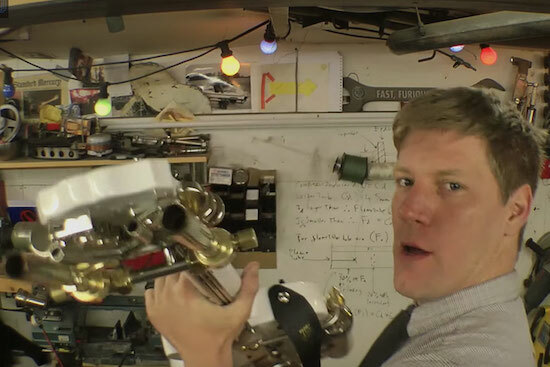 This isn’t always the case, as engineer “Tech Martian” illustrates in the video below, using a photoresistor and RGB LED along with an Arduino 101 board. His setup uses the LED to shine on a piece of paper in three colors, measuring the reflected light intensity. These reflections are first calibrated by reflecting light off of white and black paper, which can then be combined to show the colors presented in front of the emitter/sensor pair. 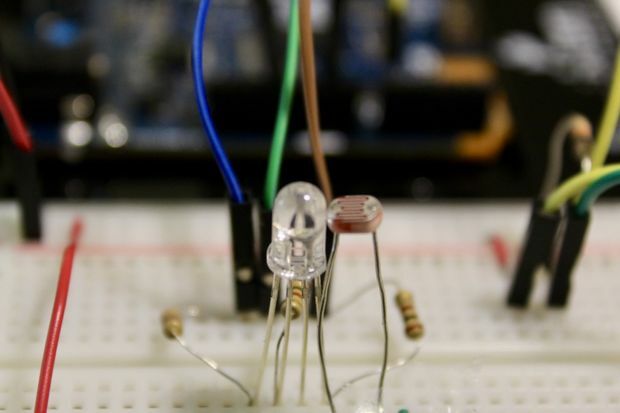 I got a comment and request from one of my Instructables that they would like to see an LED used as a color detector. Then, I got the idea that if I were to use an RGB LED, I can detect all the color spectrum possible by sending PWM signals to the LED. 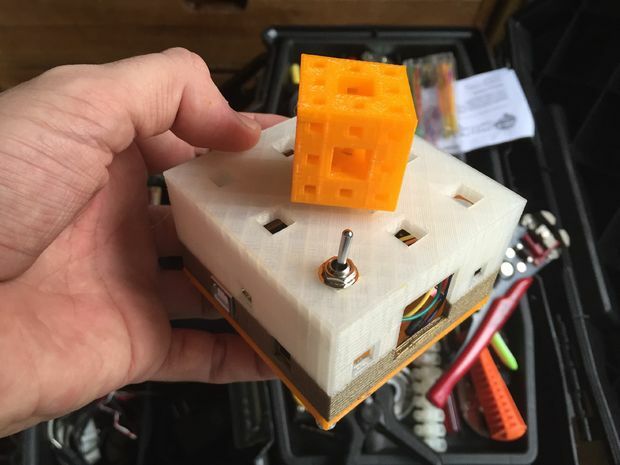 Be sure to check out the project write-up for more information, including the Arduino code! 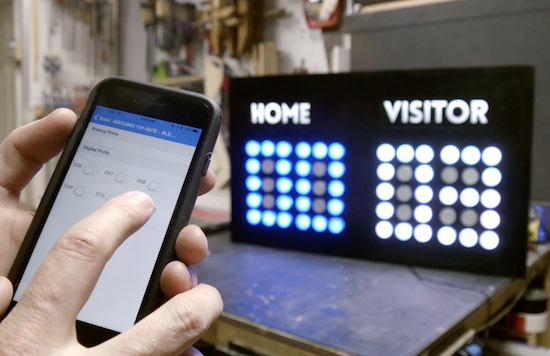 Using the Arduino 101’s built-in Bluetooth capability, Bob from the I Like to Make Stuff YouTube channel has crafted a beautiful, smartphone-controlled scoreboard. If you’re into competitive sports, or perhaps want to settle who takes the trash out the most once and for all, an RGB scoreboard is a great solution. Perhaps it’s overkill in some cases, but Bob’s creation, which he expertly makes in the video here out of MDF looks amazing, and is large enough to be seen from a distance. It’s also small enough to be nominally portable. His setup employs an RGB LED unit for each of the pixels that make up the score display, and uses an Arduino 101 as the brains of the device. 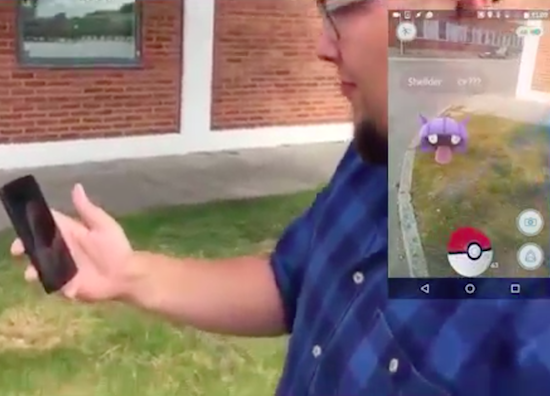 Control is accomplished via a mobile app. You can find Bob’s blurb on this project here, and the code for it on the project’s GitHub page. 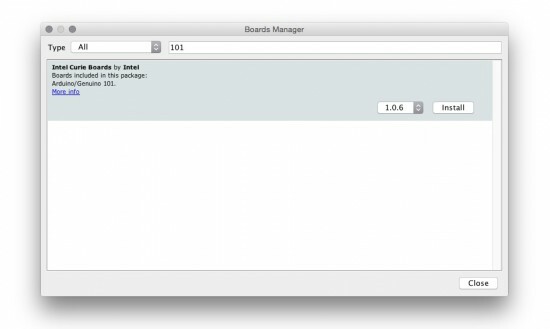 BLE 101, the app used for phone control, can be downloaded on iTunes. Perhaps you want to build an autonomous boat for collecting ocean pollution data, or a pair of shoes that play different sounds for different exercises, or maybe even a wireless gesture-based home automation controller? 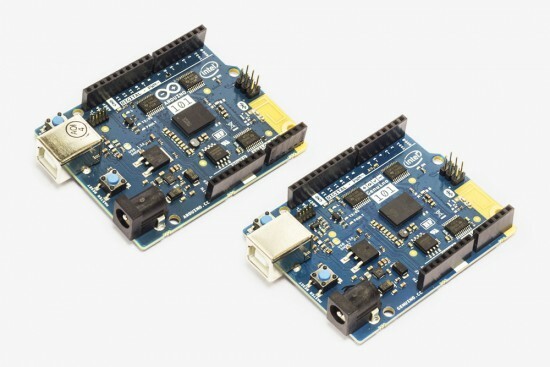 Whatever you choose, we want to see how you use the Arduino 101 as the brains behind your next creation. 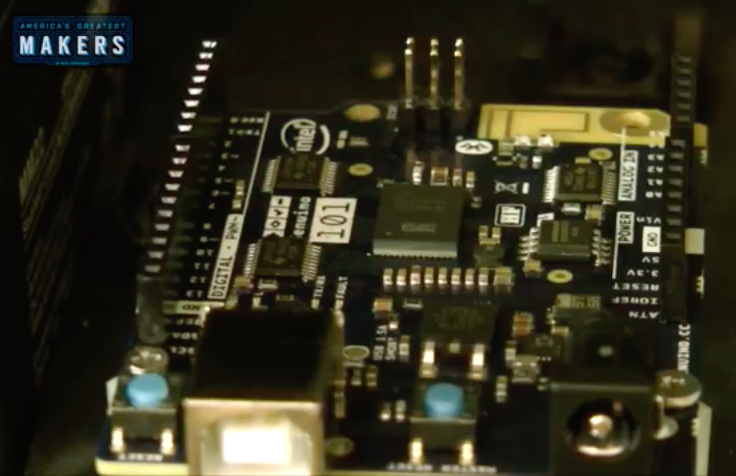 For those who may not be familiar with the 101, the board combines the performance and low-power consumption of the Intel® Curie™ Module with the simplicity of Arduino. It keeps the same robust form factor and peripheral list as the Uno with the addition of Bluetooth LE capabilities and a six-axis accelerometer/gyro to help you easily expand your creativity into the connected world. 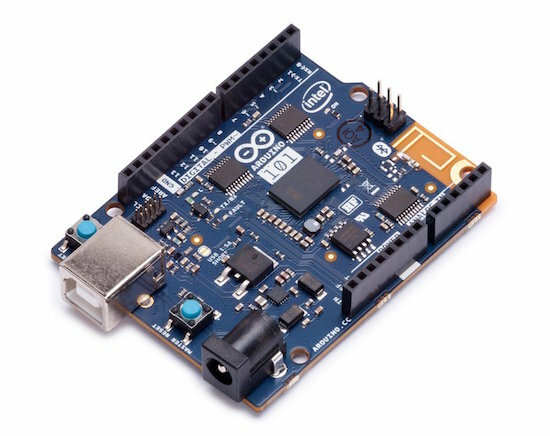 The Arduino 101 is designed with two tiny 32MHz cores: an x86 (Curie™, a Quark™ module) and a 32-bit ARC architecture core. 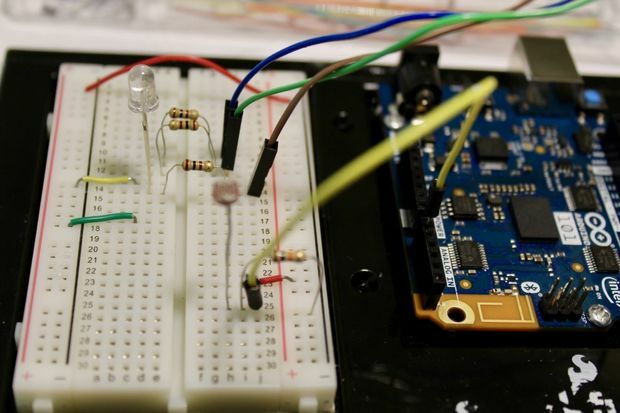 Even with this added power, the Arduino 101 is still programmable using sketches from the Arduino IDE. And now back to the contest… To kick off things, Hackster is giving away 150 Arduino 101 and Seeed Studio Grove Starter Kits to the best ideas submitted by November 20, 2016. But that’s not all, top entries in each category?—?smart home, environment, and healthcare—will receive a Microsoft Surface Pro 4! You have until February 26, 2017 to submit your projects! Want to learn more? Head over to the contest’s official page on Hackster.io. The brainchild of Tomás de Camino Beck, Polymath Boxes are experimental sound boxes. 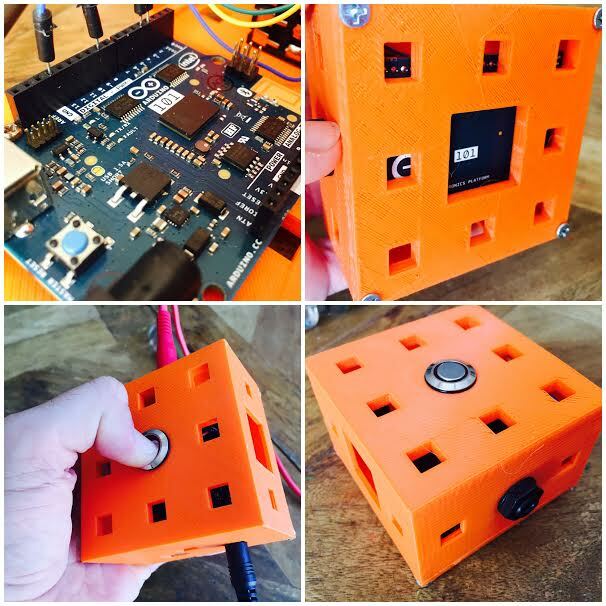 Using a Genuino Uno and 101 along with some 3D printing, these units enable young Makers and adults to experiment with programming and math to produce noises and tunes, from square and triangular waves to sample players and interactive sound generators. The boxes were originally conceived by Camino Beck as part of an open-source experimental art project with the goal of stimulating STEAM in education, from high school to college, and to allow artists, engineers and computer scientists, or pretty much anyone interested, to explore programming and digital fabrication. 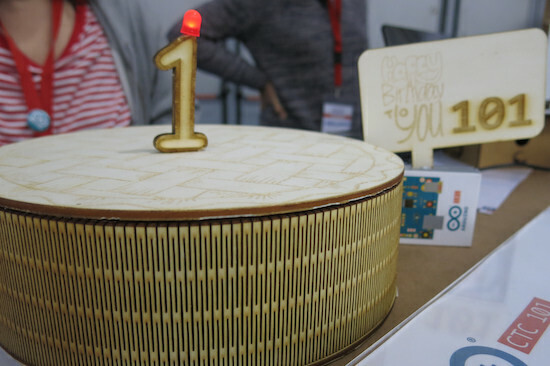 They were developed and fabricated in “Inventoria”–Costa Rica’s own idea of a Makerspace. More than just a finished project, these boxes are designed to be hacked and to help move away from more conventional ways of thinking when it comes to sound. 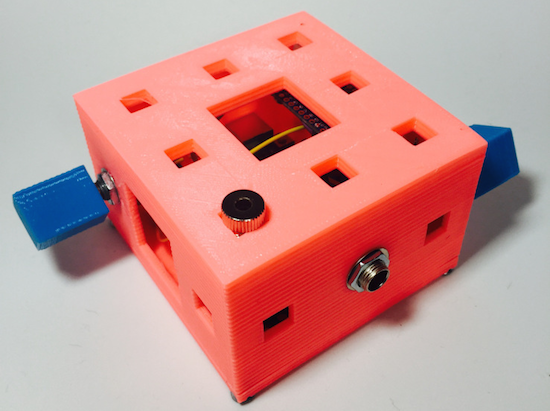 These boxes use coding as a way to “write music,” and to take advantage of the diversity of physical low cost sensors to trigger sound. Some of the boxes play with basic waves, just creating basic PWM, and others go from there to create arpeggiator and interactive. They will be used in several workshops and experimental music concerts in Costa Rica. Did you know that if you take a head of romaine lettuce and eat all but the bottom, then place it in a bowl of water, it will regrow? 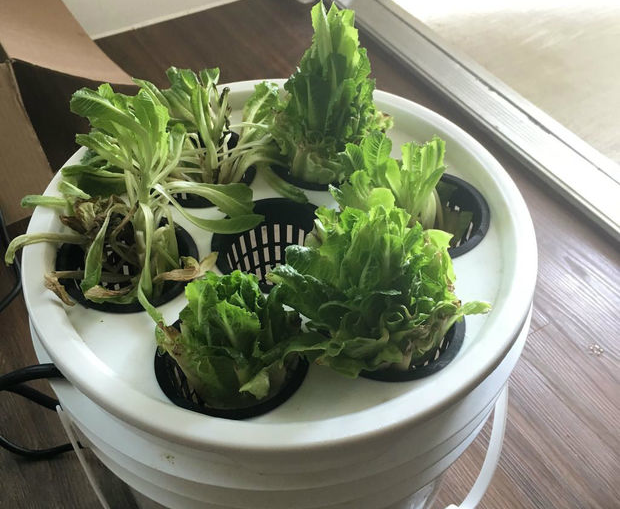 This fun fact actually inspired Instructables user Evandromiami to develop a deep water culture hydroponic system that would optimize the process for him. 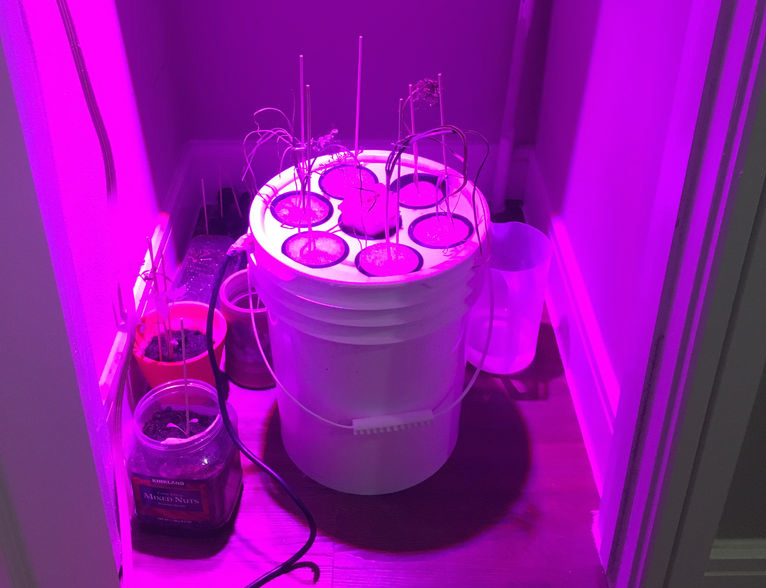 The lettuce is grown on top of a five-gallon plastic bucket filled with water under full spectrum lights, while an Arduino 101 monitors the light, humidity, temperature, water, and pH levels measured by a set of sensors. The system is controlled over Bluetooth, which enables the Maker to adjust settings and receive notifications on an LCD screen. All the electronics, including the Curie-based board, are tucked away inside a power strip and the entire hydroponic farm lives inside an A/C closet. The Arduino 101-driven project continues to be a work in progress, but Evandromiami has already begun to expand into other veggies like tomatoes. Ready to get into the world of hydroponics? Check out the Maker’s entire write-up here.